Did you know that the Museum has a conservation studio just for East Asian paintings? The Hirayama Studio opened in 1994 and continues to use traditional techniques to preserve, protect and display these amazing works. Here, student Matthias Sotiras writes about his five months spent in this unique work environment. I am an MA student in conservation of cultural properties at the Pantheon-Sorbonne University in Paris. I am fascinated by East Asian painting and Japanese conservation techniques, so I could not believe my luck when I got accepted on a student placement at the British Museum’s Hirayama Studio. On my first day here in September 2016, I discovered a lovely place with traditional wooden furniture and tatami mats, and such a warm atmosphere thanks to an amazing team who welcomed me with open arms. Panoramic view of the Hirayama Studio. As is traditional in Japan, my apprenticeship began under the watchful eye of my scrollmounting sensei (teacher), Kyoko Kusunoki, whom I call Kyoko-san. 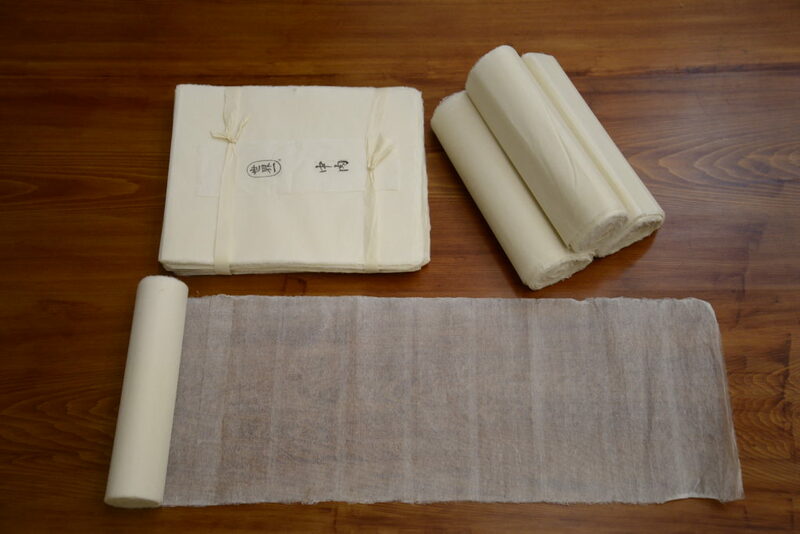 My first tasks included preparing starch paste and making scrolls of paper to be used for future linings. Preparing the wooden lattice before pasting papers onto it. The paste is made by mixing wheat starch powder with water which is then cooked on a fire stove. Lining paintings on paper and silk helps to protect, preserve and enable their safe display. A sheet of paper is pasted on the reverse of the artwork because the paper and silk are often too thin and fragile to be exposed and manipulated just by themselves. Misu paper made from kozo fibres mixed with calcium carbonate (a powder made of oyster shell). This is used for the second and third lining layers. I then went on to assist with treatments of panels from a folding screen painted by Kawamura Bunpo (1779–1821). This was part of the Cooperative Project to Conserve Japanese Paintings in the British Museum Collection, sponsored by the Sumitomo Foundation, in partnership with the Association for Conservation of National Treasures of Japan. My job was to remove lining papers from older silk fabrics placed on the edges of the panels. Using uchibake (beating brush) to ensure lining paper and calligraphy bond properly. The Hirayama Studio, is a special environment to get a taste of Japanese mounting. As part of my placement, Kyoko-san taught me about the structure of a folding screen and a hanging scroll. In October 2016, I met another Japanese scrollmounter, Aya Matoba, from Bunkazaihozon studio in Nara. She came to the Hirayama Studio to advise and finish the mounting of the painting Standing Courtesan Reading a Letter by Kitagawa Utamaro (1753–1806), as part of the Cooperative Project. Kitagawa Utamaro (1753–1806), Standing Courtesan Reading a Letter. Hanging scroll. Edo, Japan, 1805–1806. Big remounting projects like this are really impressive and are only rarely undertaken outside Japan. 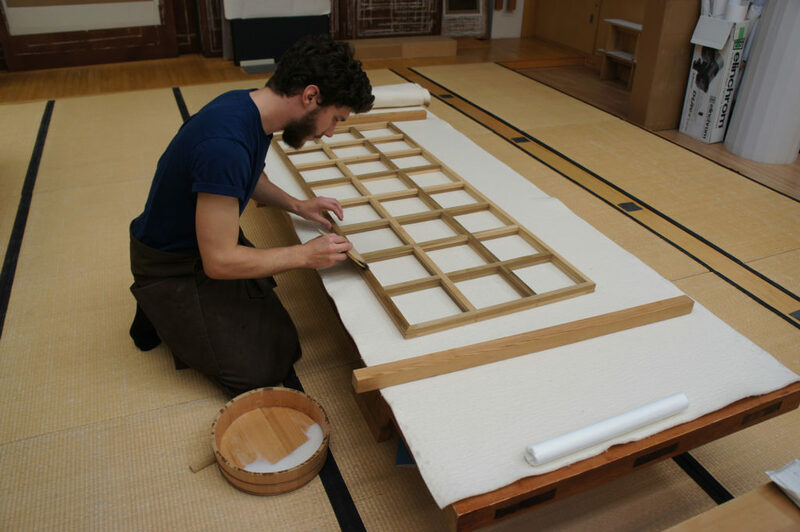 The Japanese conservation process takes a long time, and the final steps can be quite stressful as they are the culmination of a process that sometimes takes up to two years. This is in contrast to the conservation mounting process of western art, which doesn’t need long drying breaks between stages. Once every part of the mount fabric is attached together to the artwork and the whole mount has the final backing, the hanging scroll is almost finished. A wooden stave is attached to the top and a roller to the bottom, allowing a perfect hanging of the painting and a good support for rolling it up. The Japanese term for hanging scroll, kakejiku (掛軸), actually refers to these wooden parts, with kake meaning ‘hanging’, and jiku meaning ‘axis’. Aya then attached two knobs called jiku one at each end, made of lacquered wood. Finally, the top stave and roller were attached between the final backing and the lined fabrics on the top and bottom of the artwork. Top left: Aya Matoba attaching jiku on the roller. Bottom left: Aya Matoba preparing bottom edge of the mount before attaching the roller. 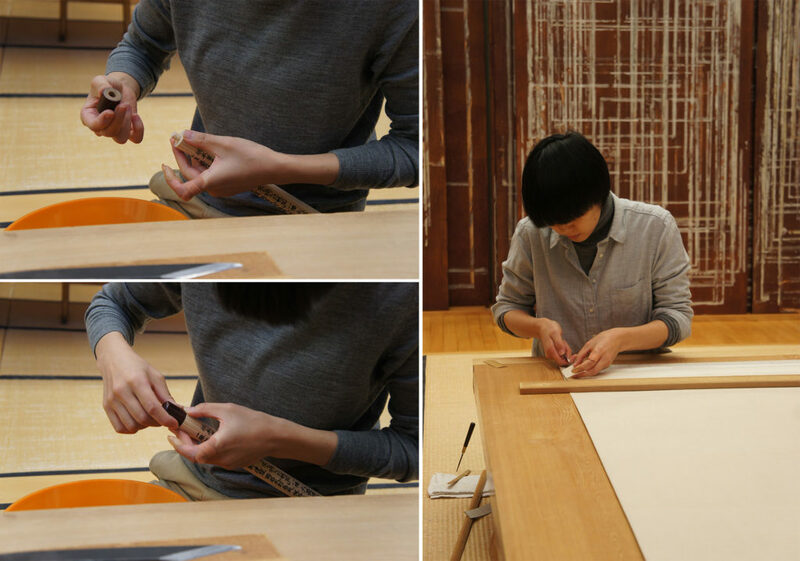 Right: Aya Matoba cutting excess of lining paper to reveal edges of the silk fabric. The finishing took more than a whole day – it is hard work requiring extreme concentration and precision. I was suitably impressed by this carefully choreographed ceremony. As you can see in the photo, I was really close to the action, not wishing to miss any of the detail! Aya Matoba cutting away the excess lining paper to reveal edges of the silk fabric. It has been such a privilege for me to be able to work in the Hirayama Studio. I have had the opportunity to see and do so much – I couldn’t have expected better. I hope that this placement is a first step into a rewarding and exciting profession – and perhaps even an apprenticeship in Japan.